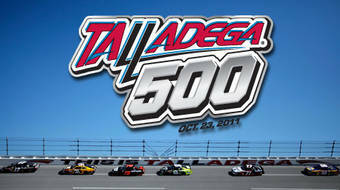 The 2018 1000Bulbs.com 500 was a Monster Energy NASCAR Cup Series race that was held on October 14, 2018, at Talladega Superspeedway in Lincoln, Alabama. Contested over 193 laps -- extended from 188 laps due to an overtime finish, on the 2.66 mile (4.2 km) superspeedway, it was the 31st race of the 2018 Monster Energy NASCAR Cup Series season, the fifth race of the Playoffs, and second race of the Round of 12. This was a notable race for Stewart-Haas Racing, who dominated in qualifying and both stages. The 2018 Monster Energy NASCAR Cup Series was the 70th season of NASCAR professional stock car racing in the United States, and the 47th modern-era Cup series season. The season began at Daytona International Speedway with the Advance Auto Parts Clash, the Can-Am Duel qualifying races and the 60th running of the Daytona 500. The regular season ended with the Brickyard 400 on September 9, 2018. The playoffs ended with the Ford EcoBoost 400 at Homestead-Miami Speedway on November 18, 2018. Martin Truex Jr. was the defending champion, having won his first in the series. The 2018 season was the fourth of the current 10-year television contract with Fox Sports and NBC Sports and the third of a five-year race sanctioning agreement with all tracks. It is the first season to feature the Regular Season Championship trophy, which is awarded at the final race before the playoffs. Kyle Busch clinched the MENCS Regular Season Championship trophy at the end of Stage 2 of the 2018 Brickyard 400.The season marked the debut of the Chevrolet Camaro ZL1, which replaced the outgoing Chevrolet SS and became the first coupe-based Chevrolet stock car since the Monte Carlo SS was discontinued in 2007. This was also the last season for Kasey Kahne, who announced his intention to retire from racing at the end of the season and was forced to step away in early October 2018 after not being medically cleared to continue, as well as BK Racing who sold its equipment to Front Row Motorsports, and Furniture Row Racing, which will cease operations after 2018. It was also the final season Ford fielded the Fusion, replacing it with the Ford Mustang in 2019.Joey Logano, driving for Team Penske in a Ford won the championship, after defeating Martin Truex Jr, Kevin Harvick and Kyle Busch in a 1–2–3–4 finish for the "Championship 4" at the final round at Homestead. Logano won three races during the course of the season, having also won the spring race at Talladega and the fall race at Martinsville. Austin Dillon was the Daytona 500 winner. Kyle Busch and Harvick won the most races with eight each; with Denny Hamlin and 7-time series champion Jimmie Johnson concluding their first winless seasons in full-time Cup competition. The 2019 Monster Energy NASCAR Cup Series is the 71st season of NASCAR professional stock car racing in the United States, and the 48th modern-era Cup series season. The season began at Daytona International Speedway with the Advance Auto Parts Clash, the Gander RV Duel qualifying races and the 61st running of the Daytona 500. The regular season will end with the Brickyard 400 in September. The playoffs will end with the Ford EcoBoost 400 at Homestead-Miami Speedway on November 17, 2019. Joey Logano of Team Penske enters as the defending series champion. The 2019 season is the fifth of the current 10-year television contract with Fox Sports and NBC Sports and the fourth of a five-year race sanctioning agreement with all tracks. It is the first season in which Ford fields the Mustang GT, replacing the Fusion. The 2020 NASCAR Cup Series (MENCS) will be the 72nd season for NASCAR professional stock car racing in the United States and the 49th season for the modern era Cup Series. The season will begin with the events leading into the Daytona 500 in February 2020 and close with the Championship Round of the NASCAR playoffs in November. The American Ethanol Green Flag Restart Award goes to the eligible driver that records the fastest average speed on restarts and finishes the race on the lead lap. A per-race $5,000 award is given to the winning driver, and a year-end $100,000 is given to the driver who wins the most awards during the season. The award is an official NASCAR contingency award sponsored by American Ethanol.The inaugural award individual race award was presented to Paul Menard for his performance at the Daytona 500 at Daytona International Speedway on 20 February 2011. Aric Michael Almirola (born March 14, 1984) is an American professional stock car racing driver. He currently competes full-time in the Monster Energy NASCAR Cup Series, driving the No. 10 Ford Mustang for Stewart-Haas Racing. A graduate of Hillsborough High School in Tampa, Almirola attended the University of Central Florida to work on a degree in mechanical engineering before leaving to pursue a career in racing. He is nicknamed "The Cuban Missile" due to his Cuban heritage. BK Racing was an American professional stock car racing team that fielded entries in the Monster Energy NASCAR Cup Series from 2012 to 2018. It most recently fielded the No. 23 Toyota Camry and Ford Fusion for J. J. Yeley, Gray Gaulding, and other drivers. In 2018, the team was involved in a court case involving team owner Ron Devine and Union Bank & Trust Company over outstanding loans. In August of that year, after being turned over to a trustee who oversaw the team's operations, BK Racing was liquidated, with the assets going to Front Row Motorsports. However, BK Racing still fielded a car until the end of the 2018 season, with help from Front Row Motorsports and NY Racing Team. David Carl Alexander Allison (February 25, 1961 – July 13, 1993) was a NASCAR driver. He was best known for driving the No. 28 Texaco-Havoline Ford for Robert Yates Racing in the Winston Cup Series (Now Monster Energy NASCAR Cup Series). Born in Hollywood, Florida, he was the eldest of four children born to Bobby Allison and wife Judy. The family moved to Hueytown, Alabama, and along with Bobby's brother Donnie Allison, family friend Red Farmer, and Neil Bonnett, became known in racing circles as the Alabama Gang. David Starr (born October 11, 1967) is an American professional stock car racing driver. He currently competes full-time in the NASCAR Xfinity Series, driving the No. 52 Chevrolet Camaro for Jimmy Means Racing and part-time in the Monster Energy NASCAR Cup Series, driving the No. 51 Chevrolet Camaro ZL1 for Rick Ware Racing and the No. 97 Toyota Camry for Obaika Racing. The Gander Outdoors 400 is the second of two Monster Energy NASCAR Cup Series stock car races held at Dover International Speedway in Dover, Delaware, the other one being the AAA 400 Drive for Autism. It is held on the last weekend of September or the first weekend of October. It is the fourth race in the NASCAR Cup Series' Monster Energy NASCAR Cup Series playoffs after the 2018 realignment. NBC has the rights to obtain the final 20 races of the season (14 of 20), including this race . This is a list of tracks which have hosted a NASCAR race from 1948 to present. Various forms of race track have been used throughout the history of NASCAR, including purpose-built race tracks such as Daytona. Obaika Racing is an African professional stock car racing team. The team is owned by African entrepreneur Victor Obaika. It has competed in the Monster Energy NASCAR Cup Series and NASCAR Xfinity Series. The team was formed in early 2015 and competed full-time in the Xfinity Series in 2015 and 2016. The team purchased some assets of BK Racing, a Monster Energy Cup Series team, in August 2018.The team is based in Mooresville, North Carolina, thirty minutes away from Charlotte Motor Speedway. It is the first African-owned team in a major NASCAR series.